Stockwood Park Athletics Centre & Performance Gym is situated in acres of beautiful parkland, making it an ideal location for improving your health and wellbeing. The centre is able to hold athletic competitions under UK Athletics rules and as a Health & Fitness Hub we host a selection of fitness classes. 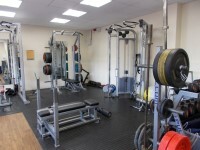 Services / facilities within the building include a studio and fitness suite. 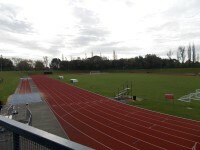 Services / facilities within the grounds include an athletics track. The dimensions of the designated parking bay(s) are 350cm x 590cm (11ft 6in x 19ft 4in). The nearest designated bay is 5m (5yd 1ft) from the main entrance. The furthest designated bay is 15m (16yd 1ft) from the main entrance. The desk is 10m (10yd 2ft) from the main entrance. 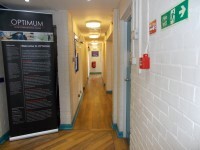 The services / areas on the floors which are not accessible are the fitness suite. 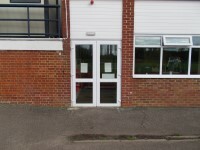 You are on Outside Access (Fitness Suite Entrance). Skip to the next section. You are on Level Change (Fitness Suite Entrance and Track). Skip to the next section. 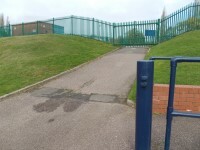 The ramp or slope is located leading from the car park to the fitness suite entrance and track side. 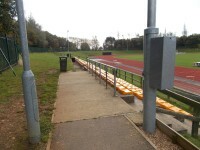 The steps are located leading from the car park to the fitness suite entrance and track side. The lift does bypass the steps. The lift does bypass the ramp. You are on Lift (Track and Fitness Suite Entrance). Skip to the next section. 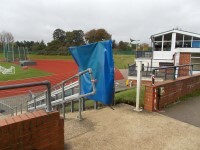 The lift is located leading to the athletics track and fitness suite entrance. The lift is 70m (76yd 1ft) from the main entrance. The dimensions of the lift are 80cm x 110cm (2ft 7in x 3ft 7in). 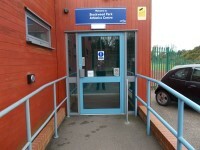 The lift can be used to access the trackisde and also the Fitness Suite Entrance. The lift was out of use at the time of surveying, please contact the venue for more information. 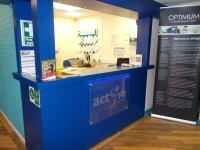 The fitness suite is located on the lower ground floor. 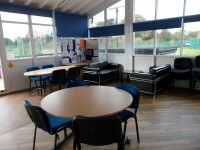 The fitness suite is 1m (3ft 3in) from the fitness suite entrance. The opening is 110cm (3ft 7in) wide. Equipment suitable for mobility or sensory impaired users include free weights and multi body station. You are on Sports Ground (athletics track). Skip to the next section. There is level access to the designated seating area. Wheelchair seating is located at the rear of the seating. A companion can sit beside / near you. The closest accessible toilet to the seating area is 80m (87yd 1ft). The accessible toilet is located inside the building to the left of the reception. 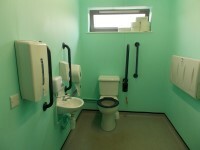 The accessible toilet is 14m (15yd 11in) from the main entrance. The accessible toilet is located to the left of the reception. 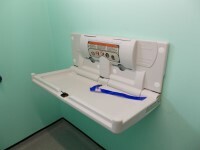 The dimensions of the accessible toilet are 170cm x 260cm (5ft 7in x 8ft 6in). You are on Accessible Changing Room. Skip to the next section. 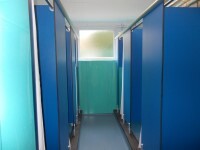 The accessible changing rooms are located next to the accessible toilet. 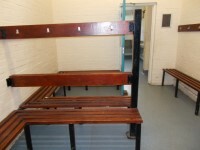 The accessible changing room is 20m (21yd 2ft) from the main entrance. The accessible changing room is 18m (19yd 2ft) from the studio. 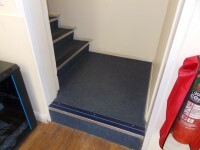 The accessible changing room is 8m (8yd 2ft) from the reception desk. 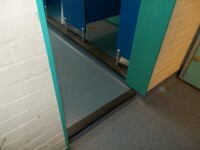 The dimensions of the accessible changing room are 235cm x 235cm (7ft 9in x 7ft 9in). 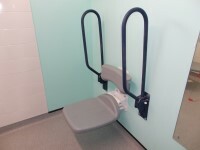 The facilities available in the accessible changing room are a wheel in shower. 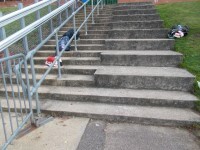 Other facilities available are a flip down seat and 2 drop down rails. The showers are located next to the accessible toilet. 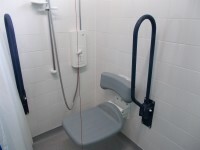 The facilities available in the accessible shower are an adjustable shower head and a flip down seat. 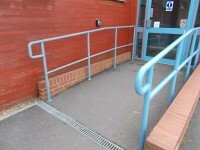 Other facilities available are dropdown rails. The female and male toilets are located at the rear of the building to the left. The female and male toilets are 6m (6yd 1ft) from the the studio. 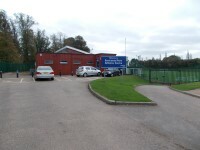 The standard changing room is 15m (16yd 1ft) from the main entrance. The standard changing room is 8m (8yd 2ft) from the reception desk. The standard changing room is 6m (6yd 1ft) from the studio. 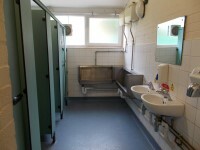 The standard changing rooms are located inside the male and female toilets. There are not standard level access shower facilities available. The assistance dog toilet area is located anywhere around the venue on grass verges.